Posted on 7 January 2016 under Book Review & Literature, Gandhi, History, Satyagraha, Women & Nonviolence. In her preface to the 1965 edition of Conquest of Violence (see References at the end), Joan Bondurant makes a strong case for distinguishing nonviolent action as duragraha or Gandhian satyagraha. She argues that duragraha involves pressuring opponents based on a de facto prejudgment that they are wrong, through passive resistance, and through symbolic violence. In a later essay (posted previously here), she adds that it is a form of stubborn or willful resistance seeking to demonstrate that opponents are necessarily wrong; that resisters are inherently righteous; and that the purpose of nonviolent action is to gain predetermined objectives by winning battles with opponents. In contrast to satyagraha (i.e., firmness in seeking truth through the power of love), duragraha aims at gaining tangible concessions from power-holders in the short-term rather than transforming social relationships and creating in the long run alternative ways of life benefiting everyone, especially the most oppressed. Bondurant emphasizes these distinctions, because she feels that most of the so-called Gandhian struggles during the 1960s are actually examples of duragraha, not satyagraha. In her eyes, this misunderstanding severely limits the political, ethical, and transformative potential of these struggles. In the 1960s, Gene Sharp—the undisputed pioneer of nonviolent action and civil resistance studies—responded very differently to Gandhi’s legacy. Unlike Bondurant, Sharp invokes Gandhi to define nonviolent action as “a technique used to control, combat and destroy the opponent’s power by nonviolent means of wielding power”, without carefully conceptualizing satyagraha or considering how it diverges from duragraha (Sharp 1973: 4). By erasing these differences, and by focusing on conventional power politics instead of situational ethics, his The Politics of Nonviolent Action articulates a generic and simplistic understanding of nonviolent action that applies to many cases of unarmed resistance throughout history and across the world. In the process, he normalizes duragraha as a pragmatic and strategic form of nonviolence, thereby hollowing out Gandhi’s concept of satyagraha while continuing to use Gandhi’s name to popularize his own approach. Since the 1970s, Sharp has quickly become the most influential figure in the field, serving as mentor to fellow civil resistance authors like George Lakey, Peter Ackerman, Jack Duvall, Michael Randle, Howard Clark, April Carter, and of course Mary King. With this move, she removes the last traces of Gandhian satyagraha in the strategic and pragmatic approach to nonviolent action that prevails among academics as well as activists today. While claiming to admire Gandhi’s political achievements, she turns his unique repertoire for constructive resistance and experiments with self-rule into an empty shell, to be filled with Sharp’s dispassionate yet systematic concepts, techniques, methods, dynamics, and mechanisms. 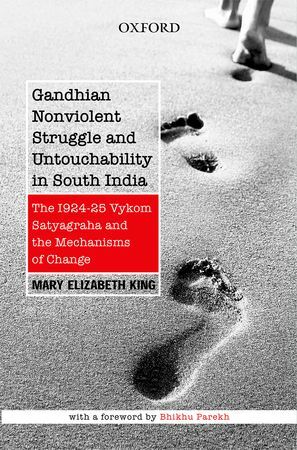 Before explaining my critique of Mary King’s book in greater detail, I want to emphasize that I have nothing but admiration for the historical research, empirical rigor, and clarity of writing displayed in her case study of the Vykom Satyagraha. But since Michael Randle in his Waging Nonviolence review, and others have already published insightful descriptions of her case study (which discusses the organized opposition against caste in Travancore society, the local Ezhava community, the satyagraha campaign, impact on the government, and Gandhi’s role in the Vykom event), I focus on some theoretical and political implications of King’s main arguments. More specifically, I want to explore how her approach to the conversion mechanism ignores Gandhi’s views on the power of love, and point to Stellan Vintagen’s theory of nonviolent action as a promising alternative to the Sharpian approach. I hope that my comments will provoke heated conversations on “the way of nonviolence” in our brutally violent world. Mary King posits that Gandhi’s main goal was to persuade upper-caste Hindus in Travancore through conversion, which she translates as “attitudinal change” (103). But although she recognizes that Gandhi played a major role in the Vykom campaign’s success, she concludes (based on her historical evidence) that the resulting compromise was possible due to a concession on both sides—not changes “in the hearts and minds of the upper castes” (237). In her view, this demonstrates “a basic fault in Gandhi’s reasoning” caused by the fact that “he was not trained in systematic analysis”(266). Thus, the main mechanism of change in this event was accommodation, with nonviolent resisters accepting a compromise and Hindu elites meeting their demands “without necessarily changing positions on the underlying issues” (273). By showing that the mechanism of conversion does not even apply to one of the few cases generally regarded as successful in the field, she suggests that smart nonviolent resisters—relying on the best available scientific knowledge—should only consider the three mechanisms of change that are likely to be effective: accommodation, nonviolent coercion, and nonviolent disintegration. In other words, Gandhi’s views on conversion are intimately related to his views on the power of love, which are crucial for satyagraha and dismissed by proponents of duragraha. While conventional scholars like Sharp and King tend to see power and truth as zero-sum games (with clear winners and losers), Gandhi proposes that satyagraha practitioners seek to create loving relationships among nonviolent resisters and with others (including opponents) adhering to divergent views of truth. He contends that in this process rational arguments are not nearly as powerful in opening up new perspectives and possibilities as appeals to the heart through what he calls “suffering love” (Terchek 1998: 144-146). Even if such appeals don’t have immediate effects on authorities, they can exert a wider “educative force” that unsettles the status quo and creates new situations (Gandhi 1951: 191; Young India, March 19, 1925). According to Gandhi’s interpretation of the power of love, therefore, conversion is primarily about self-transformation to gain the capacity to love the other, not primarily about “changing the heart and mind” of opponents. Instead of a zero-sum game aimed at winning the hearts and minds of opponents, conversion through suffering love involves significant shifts in ways of thinking, relating across differences, social spaces, and ways of life. Since such shifts are mostly internal, inter-subjective, and invisible (although they leave concrete traces in people’s mundane practices of everyday life), they cannot be accurately measured or classified according to the objective criteria of mainstream scientific methodologies. Only contextual practical wisdom and experiential knowledge can adequately (yet always imperfectly) express whether, to what extent, and in what ways participants in the Vykom campaign underwent conversion. It is therefore highly problematic and dangerous (to use Foucault’s language) for King to present her interpretation of the Vykom event and her conclusions about mechanisms of change as superior, because she uses systematic analysis and follows formal scientific procedures. And it is even more problematic and dangerous to suggest that one universal model of nonviolent action—the one originated by Gene Sharp—represents the “quantitative and qualitative leap in knowledge on the neglected worldwide history of nonviolent struggle” that should guide contemporary activists across the globe (276). Contrary to Mary King and closer to Gandhi, he recognizes that nonviolence involves more than just clashes of interests, weakening of opponents, and gaining concessions—first and foremost, it involves creating nonviolent ways of life based on everyday ethics and practices that prefigure another world that is not founded on violence and oppression. Stellan’s concept considers multiple forms of violence (direct, structural, cultural, and routine), nonviolent resistance as well as nonviolent construction (incl. the constructive program prioritized by Gandhi), and utopian visions of nonviolent society. Borrowing from Gandhi, moreover, he stresses the union of nonviolent means and ends, “without violence” and “against violence” dimensions, and nonviolent morals and practices, as well as distinctions between persons and acts, and between relative “glimpses of truth” and absolute (unattainable) Truth. In doing so, Stellan offers new ideas for going beyond the pernicious binary in civil resistance studies between “principled” nonviolence associated with Gandhi and “pragmatic” nonviolence associated with Sharp and others (Burrowes 1996: 97-123). He sees nonviolence as both strategic power struggle and utopian truth-seeking: “It is a matter of finding convincing principles that are promoted, regardless of which party stands for what, and of the nonviolent struggles simultaneously fighting for all the principles that appear justified, and even supporting opponents’ opinion when they have a point” (Vinthagen 2015: 133). In contemporary and analytical language, Stellan—unlike King and Sharp—highlights the power of love at the heart of satyagraha and provides concrete illustrations of its practice. From my perspective, Stellan’s concept of nonviolence is much more promising than the Sharpian model adopted by King and other mainstream civil resistance researchers. Without glorifying Gandhi or turning his ideas into dogma, Stellan manages to blend the political with the ethical, the practical with the visionary, the personal with the collective, and the consensual with the transformative aspects of satyagraha. His arguments do not depend on proving former practitioners wrong or telling contemporary nonviolent resisters which mechanisms of change to target. And most importantly, he is keenly aware of the tendency among contemporary practitioners to appear Gandhian while engaging in duragraha. At the end of her 1965 preface to Conquest of Violence, Joan Bondurant observes that, despite Gandhi’s transformative experiments, the task of refining the theory and practice of creative nonviolent conflict remains unfinished. Half a century later, we have made less progress than we think. I propose that A Theory of Nonviolent Action is a better source for reinventing the idea and practice of satyagraha in these dark times than books like Mary King’s Gandhian Nonviolent Struggle and Untouchability in South India. Whereas nearly every proponent of nonviolent action claims to be inspired by Gandhi, very few are capable of grappling with the complexities and ambiguities of Gandhi’s life and message. Bondurant, Joan, Conquest of Violence, (Berkeley, California: University of California Press, 1971). The title has a complicated publishing history. Princeton University Press published the first edition in 1958. The edition referred to here is the 4th printing of the 1965 revised version. EDITOR’S NOTE: Sean Chabot is professor in the Sociology & Criminal Justice Department, Eastern Washington University, in Cheney, Washington. He is the author of Transnational Roots of the Civil Rights Movement: African American Explorations of the Gandhian Repertoire, New York: Lexington Books, 2013. He has served on the editorial board for Resistance Studies Magazine and the advisory board for Interface: A Journal For and About Social Movements.